All of the listed features can be combined for building personalized trade management strategies, which can be used at any time by applying the previously defined and saved trade management profile to a selected trade. Multiple trade management strategies can be put to work simultaneously to automatically manage your Metatrader trades. Since trade management is conducted on a per-ticket basis, you can select individual strategies for selected orders, while leaving other trades intact. The editor tab uncovers a view showing 8 different trade manager tasks organized into tabs having green & red icons beside tab names, which indicate whether a given task is active or not. Trade manager tasks can be combined to work together as a complete trade management strategy. 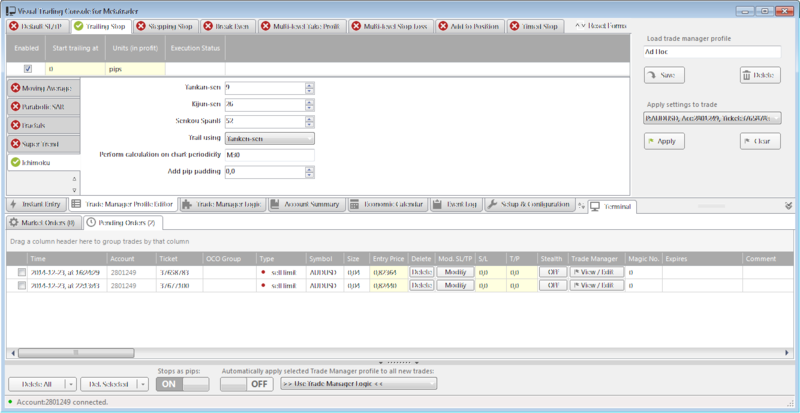 This is done by configuring selected tasks and saving them as a trade management strategy under a unique profile name. A special control panel is located to the right of the trade manager grid. 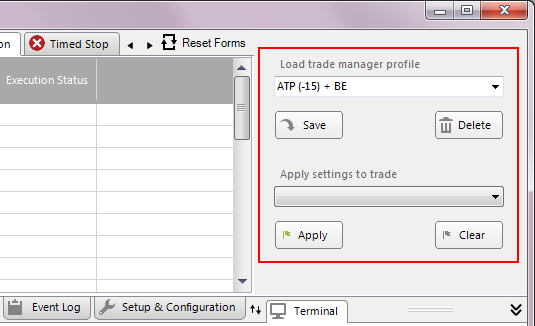 It is used to Load, Save and Delete profiles as well as Apply and Clear trade manager profiles for selected trades. The “Apply settings to trade” list box is used to select an existing ticket and quickly apply the currently viewed profile to this trade or clear any previously assigned trade manager tasks, which disables the trade manager for the selected order ticket. Trade manager profiles for a selected ticket can also be manipulated using the [View/Edit] buttons located in the “Trade Manager” column on “Market Orders” and “Pending Orders” girds. The trade manager module in the Visual Trading Console for Metatrader can perform the following tasks, which can be grouped together to create, store and use custom trade manager profiles. Please read the text below to learn more about each task, how it is defined and how it performs. All grid cells with a light yellow background are editable. The values in these cells can be entered by double-clicking the selected cell or by using the cursor keys to highlight a selected cell and starting to type. Each entry should be confirmed by pressing ENTER. This trade manager task is used to set the initial Stop Loss & Take Profit values for the managed trade. The operation is executed only once when the trade manager profile is applied to a trade, which is indicated by “Done!” in the Execution Status column. Stop values can be entered in regular pips or price values. Before entering values, proper units should be selected from the Units drop-down list. Initial SL / TP operation is only performed if the trade does NOT have SL and/or TP values set! Current stop values other than ZERO will not be modified. The “Enabled” checkbox field is used to enable/disable a given entry – useful when using a previously defined trade manager profile where we don’t want to use one of the previously defined tasks. A trailing stop is used to gradually trail the stop loss level by a selected factor such as the number of pips behind your high water mark for the floating P/L value. 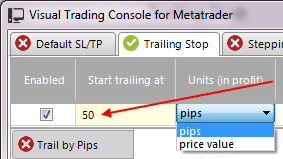 This function works similarly to the Trailing Stop feature built into Metatrader, but instead of trailing your stop right away by a fixed number of pips (when you reach your trailing stop value), it can be set to start trailing at a certain number of pips in profit or a specified price level using various trailing stop methods. This parameter is controlled by selecting the “Units (in profit)” value and setting the “Start trailing at” field. The default setting of “0 pips” will enable the trailing stop as soon as the trade is in profit. The setting illustrated above utilizes an ATR based trailing stop, that will be calculated from the last completed candle on the selected “Chart periodicity” using the setting of 14 periods ATR multiplied by 2.5. 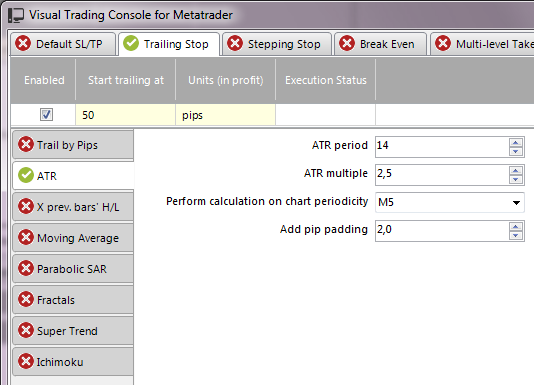 Additionally a “Pip padding” value can be added to the calculated ATR value (a setting of 2 would add or subtract an extra 2 pips to the calculated ATR value depending on the position type; short or long). Parameters can be fully customized to suit every trader’s individual preferences. 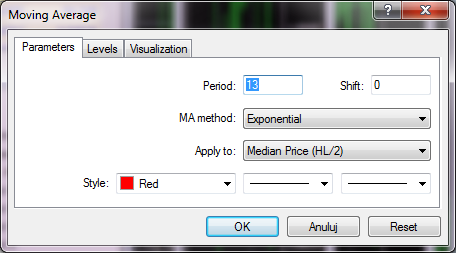 The “Perform calculation on chart periodicity” setting can be chosen from the drop-down list or typed in manually in situations when non-standard chart periods are used. For example M2, M6, M33, etc. Please note that the selected non-standard chart must be open in MT4 for the trailing stop to properly calculate the values. The current state of execution will be displayed in the “Execution” column. Stepping stop is used to perform the same stop management feature as the trailing stop, but instead of performing a linear action (advancing the stop each time the price reaches a new profit level), it moves the stop in predefined steps at specified profit level points. When the trade moves 20 pips into profit, our stop level will be placed 10 pips in profit. The setting of individual stepping stop levels is done by modifying the values in the 2nd and 4th column of the Stepping Stop table view. When pips are used as units, a negative number in the “Move stop to” cell represents a stop level “behind” the order’s entry price. This is mainly used to “tighten” the initial stop after the trade reached a certain profit level. The break-even task is used to set the stop to break even when a specified profit (or loss) level is reached. The levels can be defined by the number of pips from entry or using a certain price level. The units used can be selected from the drop-down list in the “Units (profit/loss)” column. The “break even” mechanism in Visual Trading Console also adds an optional “padding” parameter “Set stop to break even + [ ] pips“, which can be used to cover transaction costs, so that when price action hits the break-even point, at least some amount of profit is secured to cover transaction costs or even make a bit extra. The value entry table consists of two rows, one for setting the stop loss value to break even (green) and one for setting take profit to break even (red) when the price reverses against our favor by a number of pips in the negative or when it reaches a predetermined price level. These values can be used together (to cover both sides of the trade), or independently. The function will be completed when either one of the two conditions is met, so the stop will only be moved to break even once. When using “pips” as the desired units, the value entry field should be filled with pip values relative to the entry price. This trade manager task is used to scale out profit from a trade at up to 5 different levels (closing out a defined percentage of the trade at each level). Two parameters are used to define each level. These are “Target level at” (entered in pips relative to the trade entry price), which is used to calculate the price level at which a defined percentage of our trade will be closed out. This parameter is defined by the value entered into “Close” cell. Every time we define a new level, the “Remaining: %” indicator below the “Close” column will reflect the percent of the trade that should be left open once all target levels are hit. At this point, the trade manager is done with our trade and we still have 0,2 lots open, which will be closed out by our SL or TP parameters. It would be useful to set our SL to “break even” at this point (this can also be automated using the trade manager). The Multi-level Profit Taking feature is designed to work together with Multi-level Stop-Loss. When one of the targets is hit the other side is automatically updated to function correctly if the trade reverses. This trade manager task is used to scale out of a losing trade at up to 5 different levels (gradually closing out a defined percentage of the trade at each level). Two parameters are used to define each level. These are “Stop level at” (entered in pips relative to the trade entry price), which is used to calculate the price level at which a defined percentage of our trade will be closed out. This parameter is defined by the value entered into the “Close” cell. Finally, when the price hits the 1.31415 level (40 pip loss), the trade manager would close out completely. The Multi-level Stop Loss feature is designed to work together with Multi-level Profit Taking. When one of the targets is hit the other side is automatically updated to function correctly if the trade reverses. I use Visual Trading Console, it is a very useful plugin for MT4. IMO there is one thing that the virtual console should permit to do, which is place buy orders at bid and sell orders at ask. Currently, there are many forex borkers who pay you for adding liquidity (like the one I use) They pay you a fee for your filled limits orders. I use a couple of scripts to do this, it is easy. I really miss this feature in your virtual console. Please, think in adding this capacity to your software. Hi, I believe you’re talking about stop & limit orders. Some brokers indeed pay for providing liquidity. You can use “pending orders” functions in VTC to place stop & limit orders. Please use the contact form to provide a link to your broker’s platform plus more details about your specific type of order placement so I can check if there is anything more that can be enhanced in the console to help you with your trading. I’m not sure I fully understand your question, but if you’re asking if you can select the chart, where SL & TP modification lines pop up after pressing the [Modify] button, the answer is YES. is there “hidden” or “stealth” option for TP and SL? Yes, please see the following page for details: Setting stealth SL & TP using the trade manager. I can’t find a reference to “SL & TP modification lines” on the page you gave to Hans. Perhaps it’s on a different link. After setting up a stealth SL &TP, can a catastrophic SL and a large TP limit order be sent to the broker also? This would be desirable in the event the trading terminal is disconnected for some reason. The orders on your brokers server would be there to protect your position. If those orders are filled can the stealth orders be automatically cancelled? You can setup catastrophic stops without any problems. Simply set your main stops as “catastrophic” and enable multi-level stop loss & take profit as your stealth levels. In the event of your terminal disconnecting from your broker the “catastrophic” stops will be in place to protect your account and once they trigger the order is no longer valid so the stealth stops will be cleared along with the original order. Does the console connect directly to MT4 broker server or it needs an EA to attached to a chart? In addition, does it require MT4 to be running? The application connects to MT4 via EA (MT4 must be running), which is the only legal way to bind to MT4 servers. Any other way is done by hacking into the server which is forbidden by Metaquotes (creators of MT4). Brokers can also treat any direct connections as manipulation, so it is not recommended for security & legal reasons. Is it possible to add a name to the Account? Now I see more account numbers and I do not know their names. Is it possible to set a ‘Sell stop’ while the current price is lower then the ‘Sell stop ‘ price. I want the order only be executed, when the Entry price will be hit from above. Offcourse the same way with ‘Buy stop’ entries and then from underneath. The software will automatically determine whether to place a stop or limit order depending on the location of the entry relative to the current close price. If entry is never hit, the order will not be executed. However pending order expiration is not implemented at this time. I’m interested trying a moving average trailing stop. My understanding is that if say I used a 21 day EMA I would be stopped out when price touched it. What does the “shift” function associated with this type of stop refer to? I’m guessing does it add to the amount of pips price can go beyond the touch? Thanks for your rapid response. Love the trade manager. Would this mean the high minus the low of the last x number of completed bars on a selected chart period? and the lowest low of the last x number of completed bars will be used to trail buy orders. I’m curious if your trade manager work with Renko type charts on MT4 ??? Yes, all charts are supported. Even these on non-standard time frames. does your trademanager allow for my stop size to be a different size than the initial size? Fi. when a long trade gets stopped out due to market going south, can the size of the stop be twice the size of the initial trade so that the movement to the other side can be benefitted from? Are you referring to the Stop & Reverse function? Your trade manager looks t o have many helpful functions. I don’t see it listed as a SL option, but have you considered including the Kijun-sen line as a trailing SL level? I’ve found it very efficient particularly on higher time frames. Optional settings could be to choose which time chart to use (ie; 4H Kijun for SL while trading on 1H chart), and a buffer in pips from the Kijun-sen (ie Kijun-sen + 10 pips = trailing SL) Thanks. I’ll add the Ichimoku Tenkan-sen and Kijun-sen as trailing stop options in the upcoming release. Please let me know if there are any other trailing stop methods, that you would like to see added to the product. Great, when do you anticipate the new release? Also wondered how the manager is designed to interact with the built-in MT4 ‘One-click trading’ tool? Can you set and move STP, LMT and TP lines using both the MT4 One-click and levels set by the manager? Do they update each other? You can either use MT4’s built in options for moving the lines or choose to use VTC for this. 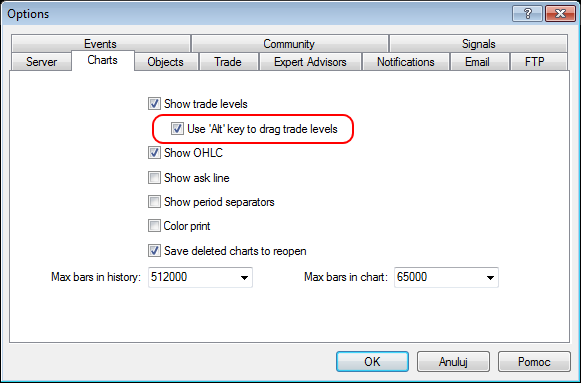 You’ll need to select “Use ‘alt’ key to drag trade levels” in MT4, so both methods don’t interfere with each other. The new release is still being updated so it will be a while, before it is out. So far, I’ve added Ichimoku as a trailing method to the trade manager. Is it correct that your trade console is a stand alone floating app that plugins into open MT4 accounts? Or does it have to be loaded onto a chart page in MT4? What RAM is required to run it? On my VPS I notice that one MT4 account with ten charts needs about 700MB. If I had additional MT4 accounts open what would your trade console require to run smoothly? It was mentioned that your version is compatible up to MT4 v650 I believe (April2014). Is it updated to run with the current MT4 v765 ? In the main page screenshot I see the “Instant Entry” tab page open. Is there a tab page that displays the most critical info like current P/L for each account, and latest trade close, etc.? Is idisplayed in a larger typeface so it can be read when 5-6 ‘ from the monitor? This would be helpful for all-day monitoring of the general trade status. VTC is a stand alone application, but uses an EA on an MT4 chart for VTC < -> MT4 communication. It will function correctly on a VPS with 1GB of RAM with about 2 MT4 terminals. The amount of required RAM will of course depend on the number of managed trades as the application alone uses around 50MB (the new version will use around 100MB). Values taken from task manager on Wiindows7. The current version of VTC is fully compatible with all latest MT4 builds. It has a separate “Account Summary” tab and a basic weekly statistics window for each account. The font is standard size, and current P/L is of closed orders only. It does not display the current floating P/L. The upcoming version will have the current floating P/L for each account. Is this program separate from MT4 or does it run in MT4? I have 7 accounts, how would it be setup and do all the accounts need to be open to place an order in all of them? The trade manager is a stand alone application, but it needs MT4 terminals to be open and each running a communication EA (included with VTC). I am unable to get the ATR trailing stop to work. I trade using the percentage risk which means I must first enter some value for the Stop. But once I am in a trade I can’t get the ATR trailing stop to function. Please note that trailing stop algorithm will only advance your stops, if the ATR calculation generates a tighter stop than your current stop loss. The idea her is to tighten, not to widen, the current stop. Also please check which chart is ATR calculated on. The values are re-calculated on every new bar. Ahhhh . . . . now THAT makes sense! Can the trade manager be used with other products such as equities? Yes, you can also use the console with equities. Generally any instrument that is available in MT4 can be managed by the trade manager.